We were introduced to Sister Janjar Boras, Superior of the Convent of the Franciscan Sisters, who treated us to a refreshing cup of tea while visiting the Convent. Father Trevor celebrated Mass for our group in the beautiful Chapel of the Convent of the Franciscan Sisters. The Mass was particularly memorable because of the awesome singing of Father and Patricia! A ‘free’ day for the group, with each doing his or her own thing. Mary and Kathy went to the David Parkes Concert, a prayer, praise and healing service. David Parkes is working in Medjugorje as Pilgrimage Director for Marian Pilgrimages, which is based in Ireland. Father Trevor celebrated a Mass for our group in the beautiful Chapel of the Convent of the Franciscan Sisters. The Mass was particularly memorable because of the awesome singing of Father and Patricia! A few years ago David Parkes was a star professional footballer, with the possibility of having a promising pop music career. He was then diagnosed with severe Crohn’s disease - he was dying. After accepting an invitation to travel to the former Yugoslavia, David and his wife Anne went there on honeymoon. It was thought that this would be David’s last trip before death overtook him. While in Medjugorje David very reluctantly attended a healing Mass being conducted by the renowned healing priest, Father Peter Rookey. Having to be pushed forward to receive the blessing, he found himself within three seconds lying on the ground. There he remained for 20 minutes. Within two days of the blessings David Parkes began to feel much better. On his return to Ireland he showed no further symptoms of Crohn’s disease and 13 years later he continues to be free of this deadly disease. One of our group, Mary D’Souza, had a wonderful experience at the evening Mass. Half-way through the Mass a lady in front of our group was pointing to the sun. Mary looked and saw the sun rotating and surrounded by the colours blue, red, pink and yellow. Others behind the group saw the same spectacle. During the Offertory, the sun looked like a Host spinning and coming towards the onlookers. It was a beautiful sight and the sun continued spinning until the end of Mass. Ainja took the group to Mostar, where Father Trevor said Mass in the convent of the Franciscan Sisters of the Schools. The convent had been destroyed and re-built after the war. On the way to visiting the Risen Christ Statue, Mary D’Souza looked up at the sun and, together with others, saw it spinning. She had her camera with her and took a photograph, noting that the time was 1:00pm. Mary says the developed picture is beautiful, with rays streaming from it. Excitement! At 4:45pm the group took taxis to Ivan’s (the visionary) house, having been invited to attend Ivan’s daily apparition in his newly dedicated chapel behind his house. 1. The Church needs priests. 2. There is a need for all people to pray for vocations to the priesthood. 3. There is a special call for priests to pray for vocations to the priesthood. 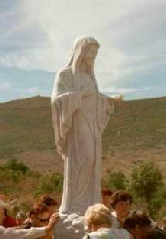 Being the group’s last night in Medjugorje, five of the group climbed up to the statue (above) on Apparition Hill after dark. They prayed silently for a while, saying farewell to Our Blessed Mother. The statue is a gift from Korean pilgrims who wanted to express their gratitude for all the graces received through Our Lady’s intercession. Sadly, it is time for the group to leave Medjugorje. As we drove away from Medjugorje, through the rugged countryside of Western Herzegovina, Ainja explained to us the history of Christianity in this part of Europe and how the people have been persecuted for centuries for their faithfulness to the Church. For over 400 years they remained faithful in the face of a fierce Islamic regime that physically massacred the priests and the faithful and destroyed all churches monasteries, convents and cemeteries - wiping Christianity off the face of Bosnia and Herzegovina. So too it has been in recent times, in like fashion, in the face of Communism and the recent war of Independence of Bosnia and Herzegovina and the internal multi-ethnic struggles of this country. Passionately, Ainja spoke non-stop for 2 hours and showed to all WHY these people of Western Herzegovina DESERVED the apparitions. The group stopped at Vrpic on the Adriatic Coast for Holy Mass at a grotto resembling Lourdes. A small chapel was available and Father Trevor said Mass there. Later, we finally arrived in Split. Bound for Rome, our first stopover towards home. At 6:45pm Our Lady appeared to Ivan, who had his back to the group but he could be seen in ecstasy and his lips were seen to move as he spoke to Our Lady. Afterwards Ivan said Our Lady was happy and that she extended her hands and blessed and prayed for the sick (there was a very sick boy who appeared to have cerebral palsy in the pew in front of our group). Ivan recommended all our petitions to Our Lady. Our Lady asked us to pray for peace in our families and in the world.